In a world where there is no shortage of high profile privacy breach attacks on an individual’s Android device, beefing up your privacy game is a mandatory requirement. The digital age comes with its pros and cons. One of the most significant downsides of technological modernization is that the instances of cyber attacks and hacking is on the rise. 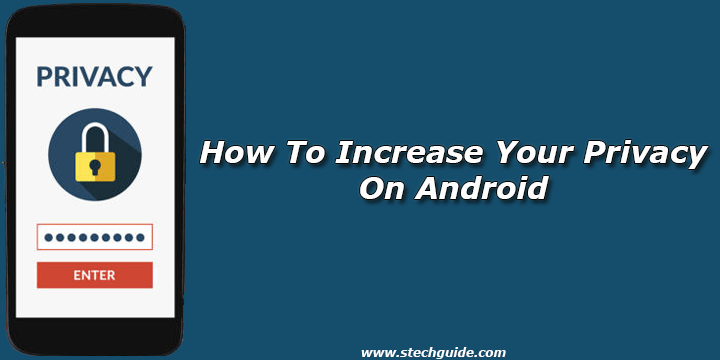 Check How To Increase Your Privacy On Android from below. Our phones store an extensive amount of data including files, emails, personal information and so on. It’s said that people with social media accounts (Facebook, Instagram, Twitter) face a 46% higher risk than those without of falling victim to identity theft so this can cause immense inconvenience to the users if the data gets compromised in any way. Fortunately, there are a plethora of options to increase privacy on Android. A wide array of privacy apps make sure that you don’t make it easy on the attacker. Android users can rest assured as they have a vast variety to make their pick. We have compiled a list of the top 5 apps to increase your privacy on Android. Let’s dive into the details. You can quickly lock your screen with passwords, pins, and patterns although this leaves your apps and other personal data expose once your screen is unlocked. Situations arise when you might have to hand over your Android device to someone else. But you might not be okay with them sifting through apps and personal data. This is when Smart AppLock can come in handy. Once you install it and sync your apps, they are not available at a single tap. If you wish to alter the individual app settings on your smartphone, Smart AppLock is the best way to go about it. No third party can view an app without inputting a password or a pattern. Gone are the days when Anti-virus software and apps were only meant to protect users from viruses. Norton is a well-known name in the category of anti-viruses. Besides preserving a device from the negative impacts of a virus, it can also remove malware and spyware. Locating the device in case of loss or theft, remote locking of devices, and blocking unwanted texts or calls are some of the additional features. As we all are aware, VPN is the best way to protect an individual’s privacy on a smartphone. ExpressVPN provides a paid service that offers full encryption of any traffic originating from your device or being directed to it. Hiding your digital footprint and keeping your web activity private could have never been easier. They can also unlock content that is usually geographically encrypted such as Hulu, ESPN, and Netflix. Unlike other free VPNs, this one doesn’t secretly mine your data. The best feature is that the app does not hold any user logs. Do you remember the time when you handed out your phone number to a sales rep and badly regretted the decision? It’s hard to find peace when you are constantly interrupted by unwanted calls and texts. Hushed is an app that enables avid smartphone users to keep their phone number private by generating a burner number. The temporary number is ideal in instances when you have to post an advertisement or sign up for services. Most people have one business and one personal phone number. It eliminates the requirement for carrying multiple phones. You can also manage various lines and create an alternate caller ID. Despite Google being one of the most popular browsers, it has a provision of ingesting user data. While signing up, the users agree over constant monitoring of their digital activities without even knowing. For example, you must have noticed travel recommendations coming up now and then after browsing something similar. This indicates that some of the policies by Google are invasive to the privacy of the user. DuckDuckGo is an alternative to Google. It is a search engine designed to protect user privacy and information. When a user searches for information, the browser goes out of its way to eliminate any unwanted information the apps and websites are holding about the user. It also forbids advertising networks from tracking users. One of the most significant downsides of being a smartphone user is that your device is always exposed to malicious attempts of privacy breach and attacks. It is difficult to attain 100% security, although that doesn’t mean that you should make it easy for the attacker. Besides installing one or more of the apps mentioned above, you should also limit app permissions and follow an essential security protocol for smartphone usage to Increase Your Privacy On Android. If you have any doubts comments below. Stay connected with us via Facebook, Twitter, and Google Plus to read more such helpful posts.